This recipe is by Shirley Spear at the award winning Three Chimneys Restaurant on Skye. It is reproduced here by permission of A Taste of Scotland. While the recipe uses Talisker whisky any light whisky will do fine. 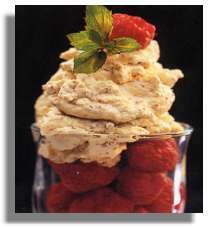 Cranachan: Whisk the cream together with the honey and Talisker. Fold in the toasted oatmeal. Pile on top of fresh raspberries and serve with shortbread biscuits. Shortbread : Cream the butter and sugar together until pale and fluffy. Work the sifted flour and rice flour into the creamed mixture until it forms a firm paste. Knead it lightly on a well floured board. Roll it out until quite thin and cut biscuit shapes with the cutter of your choice. Using a palette knife, lift the biscuits onto a well buttered baking sheet. Bake on the centre shelf at Gas Mark 5/375F/190C until pale golden in colour. Remove from the oven and sprinkle liberally with caster (fine granulated) sugar while still warm. Lift on to wire tray to cool and firm-up. Store in an airtight tin.